Riverview Apartments, 5360 Riverview Road, with 42 units of essential, affordable housing for seniors in the Nokomis East neighborhood of Minneapolis, is now open. It is three blocks from a light rail transit station and within walking distance of local businesses. 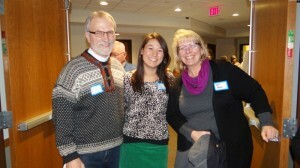 Beacon Interfaith Housing Collaborative (formerly PORTICO Interfaith Housing Collaborative) and CommonBond Communities, nonprofit housing providers, developed Riverview in partnership with Minnehaha United Methodist Church and Lake Nokomis Lutheran Church (ELCA), both in Minneapolis. The congregations led initial community support for the $8 million project, which was awarded $6 million in Housing and Urban Development funding, the first such investment in Minneapolis since 2002.